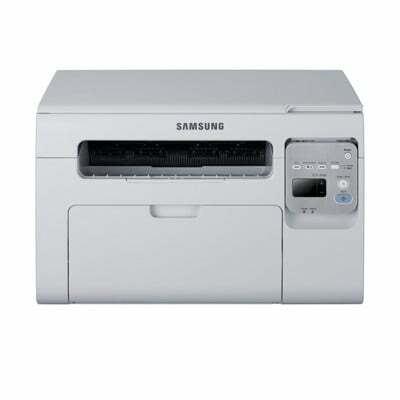 The Samsung SCX-3400F is a monochrome multifunction printer equipped to print, copy, and scan. Enjoy consistent quality black prints from this machine. This printer is compact in size and most suitable for a small business environment. It is reliable, has a simple design and is easy to use. Unfortunately, the warm-up time required to get the first print and total pages printed per minute could be faster. Compact in size, this printer measures just around 389 x 274 x 249 mm. It weighs about 6.7 kg. The printer is greyish-white with a light grey texture on the sides. The buttons and small pop-up display appear on the front side of the printer with just a few simple buttons. The output and paper input tray are neatly designed on the front of the Samsung SCX3400F as well. This printer fits in an enclosed space as long as the front and top have ample space to access paper, prints, and the hinge-open top for copying, scanning, or faxing. The Samsung SCX-3400F prints at a resolution of up to 1200 x 1200 dpi. Printing on letter sized paper yields about 20 ppm. This printer saves money and the environment by saving on toner and paper with eco-friendly features like the built-in economy button. Additional money saving features include the ability to print many pages on one sheet of paper and duplex printing. You can also lower your power usage as this machine automatically reduces power when it is idle. Wireless printing and networking capabilities make life easier. The Samsung SCX3400F is a fair printer for any small business or home office. While printouts are not too slow, they could be faster when considering the extensive warm-up time required. Some monochrome printers can produce prints at almost double the print speed.